We’re going to need a tougher slab. In Augusta, Georgia, thousands of tons of railroad cars and steel components are shipped to and from a major rail maintenance facility every week, wreaking havoc on the hardstand concrete slabs that cover the yard. The punishment from rolling loads, impact loads and abrasive wear is so extreme that the facility has maintained a quarterly rip-and-replace program to deal with the persistent failure of their slabs for more than 20 years. In an effort to extend the service life of the concrete and reduce replacement projects, an alternative design was proposed which increased overall thickness of the slab, required steel reinforcement, additional sub-base preparation, corresponding excavation, and most significantly, cost. Enter Mr. Brett Cooper, owner of CPI. He heard about the impressive results EdenCrete had achieved at the GDOT trial (see story) through Augusta Ready-Mix, so he reached out to EdenCrete for a consultation about the project. After careful study, the team ascertained that CPI could achieve the durability, quality and longevity the railcar facility desired by using EdenCrete carbon concrete additive—without much else. 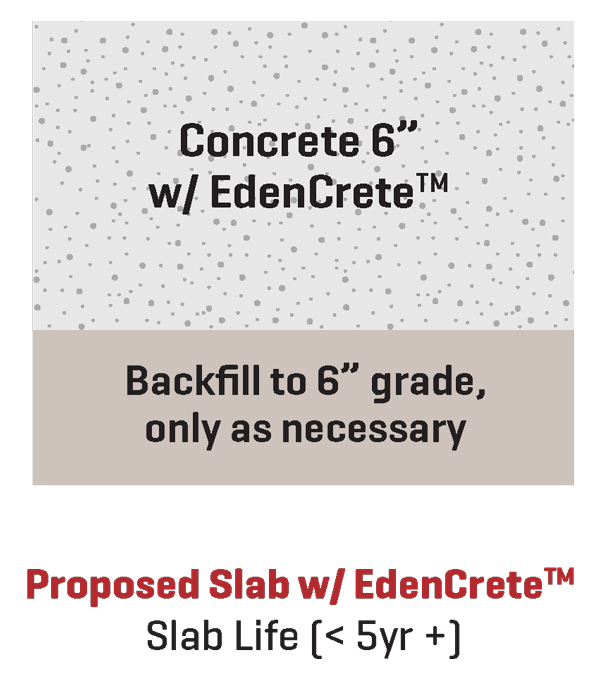 Using the same formulation as the GDOT trial (minus the accelerator), CPI poured a 10 cubic yard slab enriched with EdenCrete, and a second “control” slab without EdenCrete. Both slabs were 6 in. thick. Six months later, the EdenCrete slab looked great and had not cracked. However, the “control” slab showed major cracking. The new results with EdenCrete were so promising that CPI and the facility’s owner decided to move forward with the EdenCrete solution. The EdenCrete solution is expected to at least double the concrete life, yet require much less concrete, no steel reinforcing and greatly reduced excavation time. Consequently, the budgeted repair costs, with EdenCrete, are 40%-45% less than the earlier proposed ultra-high strength concrete design.